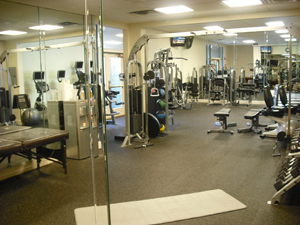 The Bayou Club's well-equipped private fitness center is the perfect place for your daily workout. The fitness center has the machines, the weights and the cardio equipment to get you in shape and keep you toned. The Bayou Club offers Personal Training with our own Club Trainer David Bauer. David welcomes new Members with a complimentary fitness assessment and will show you how to use various machines. David is available by appointment and comes highly recommended by the Club members! The Bayou Club also offers a “Flexibility for Golfers” class for members on Tuesdays from 4:00pm-5:00pm run by Personal Trainer Annie Schieser. This class focuses on providing a better quality of movement during workouts, golfing and everyday life. The fitness center is open to Members 24-hours, 7 days a week.